The Injury Prevention Program in Kansas City is a collaborative effort between Patient Care Services, Emergency, and Surgical Trauma Services at Children's Mercy Hospital. Continued efforts are focused on reducing the impact of injuries on the lives of children and their families through service, research and advocacy. The program assesses neighborhoods with high-injury risk factors and provides injury prevention strategies that will best address their needs. Under the directorship of doctors David Juang MD, CMH Surgery Trauma Services and Director of Truama & Burn; the Kansas City Coalition is a hospital based community resource for injury prevention efforts. Program Coordinators are Phyllis Larimore RN MPH PhD(c) and Christy Cassidy LPN and Burn Prevention Specialist. The hospital based program highest priority is to serve children with special health needs during hospitalization and through the sub-speciality clinic visits. 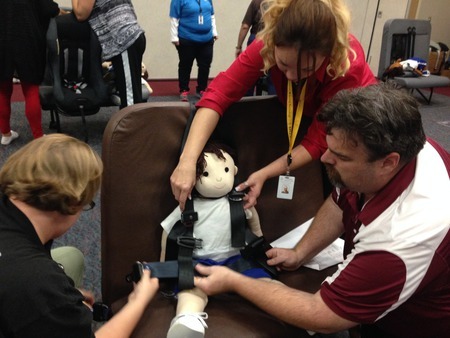 The car seat program is staffed by a certified child passenger safety technicans(CPST) who have specialized training in working with children with special health needs. Healthcare providers assess child passenger safety needs of every child, 0-8 years, upon admission to the hospital and during well-child visits. The hospital based car seat program provides bedside consultation Monday through Friday upon request by healthcare providers at no cost.The hospital operates a loaner program for HIPPO or a HOPE car bed for children who can not tolerate or "fit" a conventional car seat. The certified child passenger safety technicans and instructors: Phyllis Larimore and Shannon Bernal offer distance consultation to child passenger safety technicians and instructors as well as case managers and parents. The hospital's traffic safety program includes child passenger safety courses approved by the National Highway Traffic Safety Administration's National Child Passenger Safety Training Course, Safe Travel for All Children: Transporting Children with Special Healthcare Needs, and Improving Occupant Protection for Non-Critical Pediatric Patients in Ambulances: A Training Curriculum for EMS Personnel. In addition, specialized traffic safety in addition to basic CPS programming to child care, school transportation staff, community stakeholders and partners. Approximately 7 out of every 1,000 babies die in the greater Kansas City area. This alarming statistic has brought together members of the hospital staff and coalition to work together to develop a small pilot project will commence this fall. The "safe sleep" study will describe bedside nursing practice related to safe sleep in infants considered at high risk of sudden unexpected infant death syndrome related unsafe sleeping practices by parents and other caregivers. Interventions include bedside nurse safe sleep education and training, use of sleep sacks to avoid over heating, portable cribs and pacifers as outlined by the AAP's Back to Sleep recommendations and assessment of in-home sleeping environment and practices for risks. IFKC staff collaborate and support Charlie's House, a local injury prevention organization (http://www.charlieshouse.org) aiming to prevent unintentional childhood injuries by targeting their primary careproviders, usually, the parents but extend to grandparents and other relatives who supervise their safety including child care providers. The IFKC staff provide on-site presentations at the safety demostration model home and throughout the community. A major theme is prevention of furniture tip-overs such that took the life of the 2 year old Charlie when the 30 inch dresser tipped over as he attempted to reach for a toy on the top of the dresser. The organization provides training in how to restrain furniture and provides free restraining straps to parents and caregivers. Christy Cassidy, LPN, Burn Education Specialist, and Burn Clinic Coordinator, provides clinical care in the Burn Clinic, participates in evidence based research as well as offering professional and community injury prevention presentations. Christy also collaborates with the local and regional Safe Kids coalitions and Charlie's House injury prevention programming. The coalition worked with neighborhood associations to build playgrounds in the urban core of Kansas City: Ivanhoe, Montgall and most recently, the Longfellow Elementary School playground with the support of All State Insurance. Currently underway, is an assessment of the parks & playgrounds using the Community Park Audit Tool (CPAT) developed by Kaczynski, Stanis & Besenyi in 2010. A new focus of community outreach is to promote walking and biking to school in 3 elementary schools in Kansas City, Kansas. The program includes site assessment of transportation behaviors of the students as they arrive at the schools. The targeted population for the study are 5th graders who are bike riders will be invited to participate in the program. In collaboration with BikeKC, the fifth grade graders will be recruited to register for the Bicycle Lesson and Safety Training (BLAST). The core concepts of BLAST are safety, confidence and skill acquistion. The measureable outcomes are improved bicycle handling skills, proficiency of basic traffic skills & identification and avoidance of hazards. The BLAST program has been certified to meet the state's educational criteria and is offered in 4 one hour segments to 15-20 students during a PE class. There are currently no events listed for Kansas City.